I no longer am the mom of a "Teenager" -- my baby turned 20 on Saturday! Because this is an extra-special event, I wanted to make an extra-special card for her. And got to work. 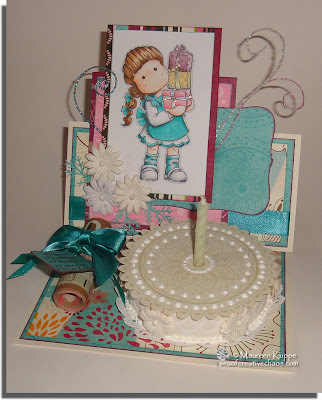 First I chose the image -- I can't believe this is the first time I have inked up my Tilda with Wedding Gifts stamp! She is so cute for birthday cards too! Next, the papers. I was so lucky to find some great Bo Bunny (my fav!) paper that was PERFECT for the cake top. It had a circular design that I simply cut out and "frosted" with Scribbles 3D white fabric paint. 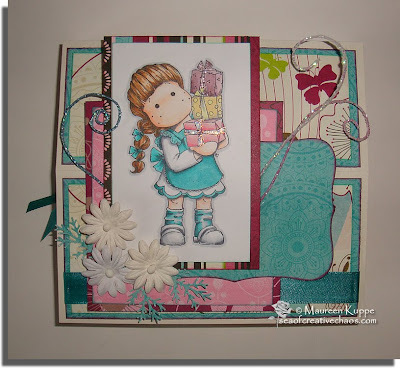 As a matter of fact ALL the patterned paper on the card are from Bo Bunny's "Sophie" line. Some really old embossed paper I got from Michaels back in 2006 called Vine Cream was used to create the easel card base and the cake itself. The side of the cake is decorated with Martha Stewart's Double Loops edge punch. I also glued some Recollections flowers to the sides, attached the cake to a Wilton doily and finished off the bottom edge of the cake with more 3D white paint to mimic frosting. 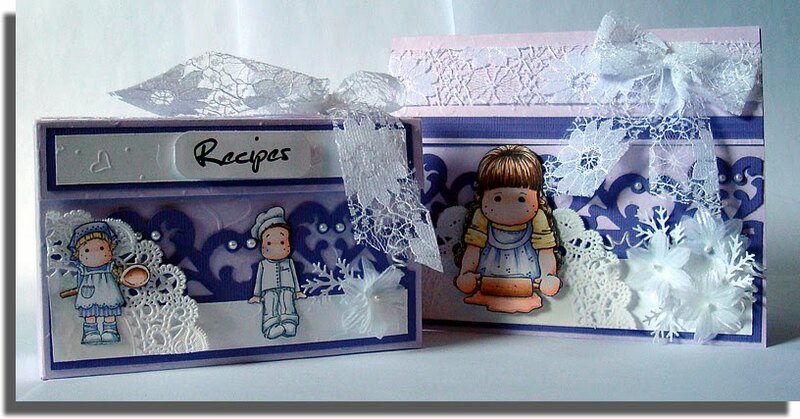 Other supplies used on the card include Michaels satin ribbon coloured with Copic BG49, ColorBox inks, Martha Stewart Fern punch, Recollections floral spikes, and Diamond and Milled Lavender Stickles on the prezzies. When folded up, the candle is slid into the "gift" beside the cake -- since there was only one, I didn't include a candle box as shown in the original tutorial; instead I rolled up daughter's monetary gift and wrapped it with ribbon and tag topped off with a bow. 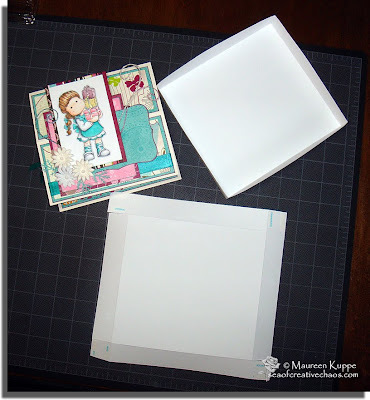 Since this card is quite bulky, I made a box from white cardstock. The measurements of my card is 6" X 6.5", so I cut two pieces of 8.5" X 11" paper: one 8.5" X 8" and a second slightly larger for the top: 8.5" X 8 1/8". After scoring 1" on every side, folding, cutting and adding ScorTape to the flaps, viola! I have a box to transport the whole shebang without scrunching it up! Since this month our family has been invited to a cousin's nuptials, I have also been invited to attend the bride's Wedding Shower... and a request in the invitation was to bring a favorite recipe to pass on to her. So I created both a Wedding Shower gift and card to give her. 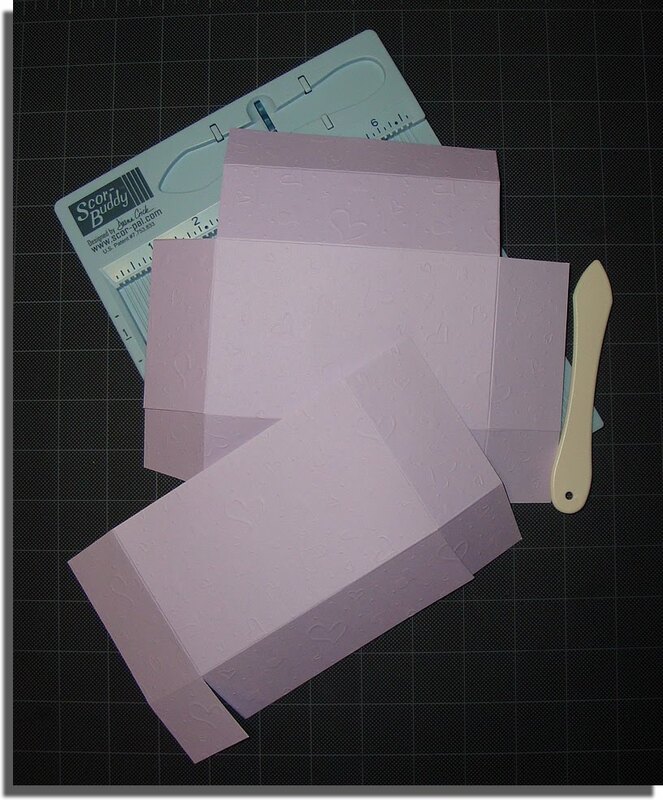 1 - 8.25" X 12"
1 - 8.25" X 7.25"
1 - 8.25" X 4.75"
Add Scor-Tape to the sides and bottoms to create your box with a top flap. I added two Basic Grey thin magnets so it snaps shut. Just use Scor-Tape to adhere the first side of the magnet to the inside of the front of the box. Then snap the second magnet in place on the outside front of the box to line it up. Add Scor-Tape to the outside of the magnet and press down the flap to adhere it in the proper position (I remove the adhesive these magnets come with, since Scor-Tape is so much stronger). You will need to place something hard inside the box to press down onto -- I found two acrylic stamp blocks worked perfectly. (You could also do this step BEFORE putting the box together, but I didn't think of it until I had the box taped up!) I finished by covering each magnet with cardstock so they won't be accidentally knocked off when in use. If you want to make a matching card, you can certainly use the leftover piece of 3.75" X 12" cardstock. I had a second sheet of matching paper, so I cut a piece 12" X 6" and did a triple fold card to mimic the shape of the recipe box. The finished size of the card is 5" X 6". My box and card set features the following three stamps: Mini Kitchen Tilda, Mini Chef Edwin and Tilda is Baking. E0000, E00 E01, E02, E11, E13, E30, E33, E35, E37, E49, E53, E57, E59, BV000, BV01, BV02, Y000, Y21, C0, C1, C2, C3. 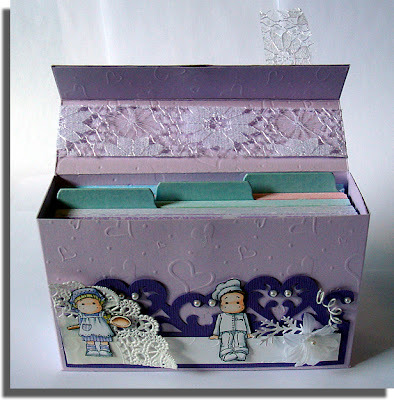 To create my recipe box and matching card, I used both the Lavender and White Heart embossed paper I got from Michael's years ago. 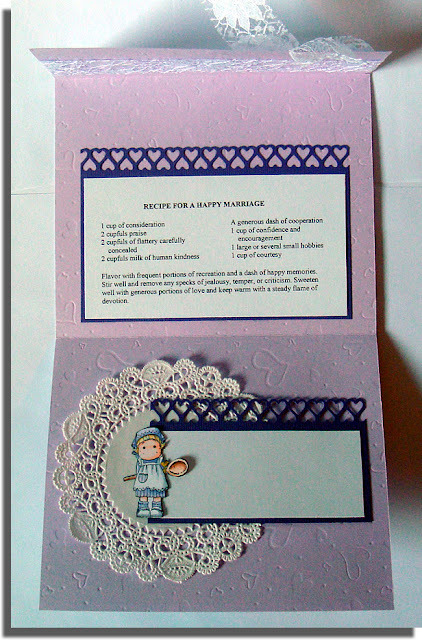 Bazzill Purple Pizzazz cardstock was also used. Two Martha Stewart edge punches created the Scroll Heart and Loops Heart designs. The lace ribbon is from Dollarama Crafts, the pearls and flowers are from Michael's and the doilies are made by Wilton. The leaves are made with the Martha Stewart Fern Punch. Inside the card I typed up an edited version of "A Recipe for a Happy Marriage" I found on the net. I hope the bride-to-be likes it! Here is a new card; it's always a good idea to have a few "Thinking of You" cards on hand. This 5.5" X 5.5" blue Bazzil cardstock base was layered with some of my favorite paper: Bo Bunny's Calypso Dream: both sides of this two-sided paper was used for the background and the left side mat. Pulling out the colours from this design, I matted each element with red, blue and yellow Bazzil cardstock. Since my Martha Stewart butterfly punch was too large, I used her Monarch Butterflies Trim Punch on the blue and yellow cardstock and cut out individual butterflies from that for the embellishments. 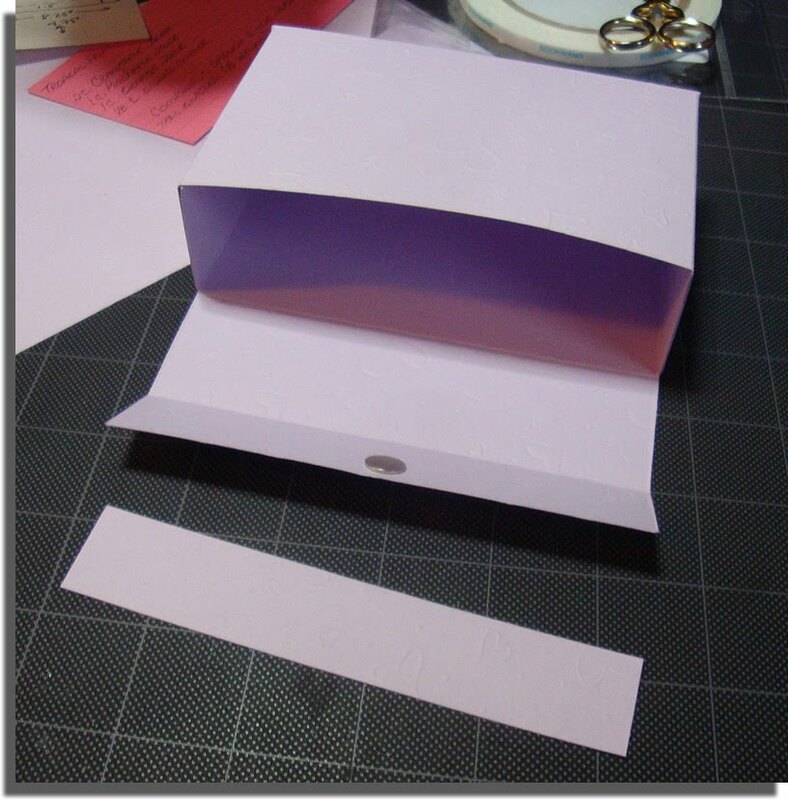 I folded each one and glued the bodies to the card for extra dimension. My circular element is a paper doily by Wilton. I used sheer polka-dot ribbon to keep the focus on the image. Lastly, I used some Diamond Stickles on the wings for a touch of glitter.